Never mind the tropical sun. Visit Florida and dis the space program, and the reception you'll get is going to be awfully cool. 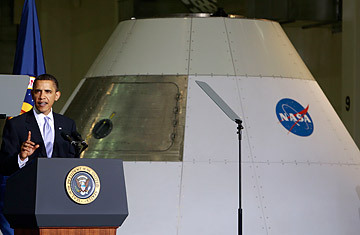 Nobody knew that better than President Obama on Thursday, when he toured the Kennedy Space Center and then spoke to a roomful of 200 VIPs about his plans for NASA after the shuttle program ends later this year. The President had to know that more than the agency's future could be on the line. In Florida  the ultimate presidential swing state  his could be too. So how was the temperature in the room? Chilly  and not without reason. Obama's take on space has never been an easy thing to track. During the campaign, he targeted NASA as a likely area for budget-balancing cuts. Electoral arithmetic made that position untenable, and he quickly backtracked, pledging a robust future for the space agency, albeit one that would take it in a different direction from the one the previous Administration had pursued. That direction had involved mothballing the shuttles by this year and replacing them with what was known as the Constellation program, a collection of projects that involved building new spacecraft for both orbital flight and trips to the moon, as well as two new boosters  one for humans and a powerhouse version to lift heavy cargo. Once elected, Obama began changing course fast. He started by sacking Michael Griffin, the fiercely focused if not always interpersonally winning NASA administrator who had pushed the program along to the point where metal was being cut on the new spacecraft and the booster Ares 1X was poised for launch. In Griffin's place, Obama picked Charlie Bolden, a former astronaut and a bit of a cipher. In February, the President finally filled in some of the details of his plan and sent Bolden out to sell them  and the howls were immediate. Constellation would be scrapped, as would any NASA plans to design and build new boosters and spacecraft. NASA's roughly $15 billion budget would actually be increased by about $1.5 billion per year, but most of that would be invested in a vague series of projects that included developing advanced robotics, life-support hardware and flight systems like in-orbit refueling. The design and construction of the spacecraft and boosters would be turned over to private industry. Missing from all of this was any clear sense of where we would go or what we would do if all this new hardware could be built, and Bolden didn't help much, serving up generalities about blazing new trails and answering bold challenges, but not much more. The rollout laid a deserved egg. The White House regrouped, and in March promised that the President himself would go to NASA on April 15 to explain the plan more fully. That didn't do much to boost the mood either in Houston or along the Florida space coast  the residential and industrial communities that depend on NASA for their livelihood. Things got even worse for the President just two days before his visit when a Rushmore-like lineup of Apollo veterans  Apollo 13 commander Jim Lovell, Apollo 17 commander Gene Cernan and Neil Armstrong, commander of Apollo 11 and the first man on the moon  released an open letter to the White House criticizing its space policy as "devastating," and one that "destines our nation to become one of second- or even third-rate stature." The fact that Armstrong, who has made a postmoon career out of avoiding controversy and publicity, signed the letter ensured that it got headlines. It was into that storm that Obama flew Thursday, and for a visit that had been so long in the making, there were some tactical blunders almost from the outset. Before his address, the President visited Launch Complex 40, where the Falcon 9 rocket, built by the SpaceX company, is poised for launch. Falcon 9 is one of the private boosters that would replace NASA's own rockets, and while the optics might have been intended as eye candy  for space nuts, Falcon is an undeniably pretty machine  plenty of NASA folks want nothing to do with the private-sector interloper. Worse, though the White House billed the speech as aimed at the workers and other foot soldiers in the space program  many of whom will lose their jobs when the shuttle program is over  the event was closed except to a select, invitation-only audience. The rest of NASA watched on TV. See pictures of NASA's great moon-buggy race. See the 50 best inventions of 2009.